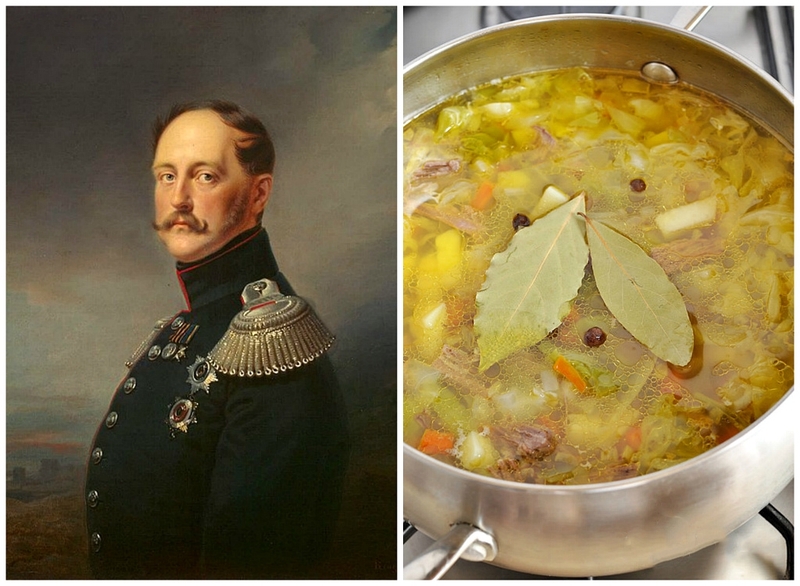 What did Russian emperors like to eat? Here we are going to tell you about their food interests. Some of them were real foodies! 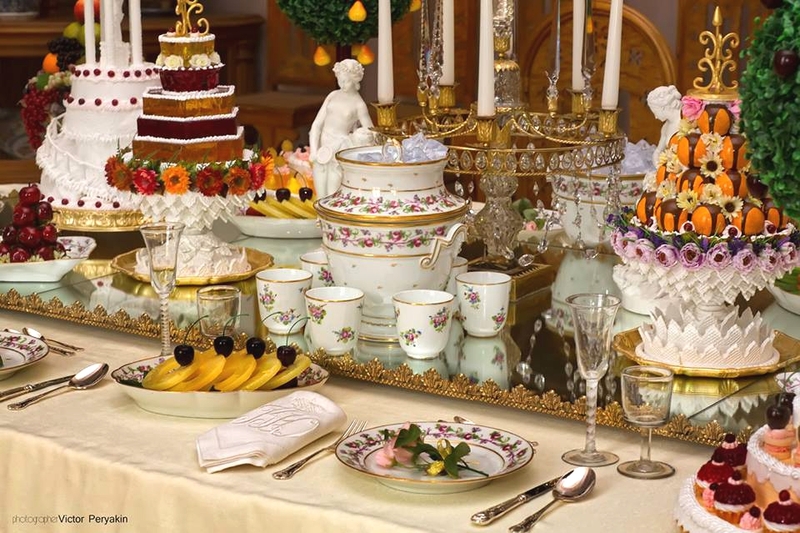 Russian Tsar Alexander I was fond of green teas and was having them every day in the morning, usually 7:00am with whipped cream and fried white bread toasts. At 10am he was eating fruits after returning from a short walk outside. He especially preferred strawberries. At 4pm he had a lunch and then went on a horse ride. At 9pm he had a tea and at 11pm some fermented milk and sometimes prunes. – these are the memories of his doctor. Probably a green tea in the morning and prunes and yoghurt at night was a recommendation by the doctor who cared about the Tsar’s digestive system. 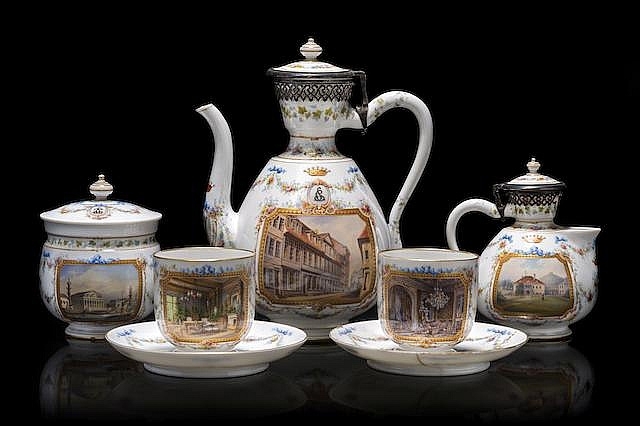 This is Alexander the First’s tea pot and cups. Fruits that he had everyday were grown in the hothouses around the capital. The Emperor’s court was buying most of the fruit grown locally. 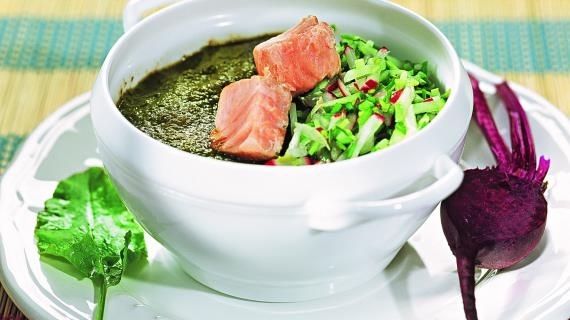 He also liked a Russian dish called “botwinya” which consists of Russian fermented drink Kvas, beet leaves and onions and fish. Also Alexander was fond of tea with honey. It was said that during the emperor’s balls he served tea with honey and the women who were present were often sweating because of this and then easily caught colds because of cold winds, so they asked him to stop serving tea with honey during the balls. 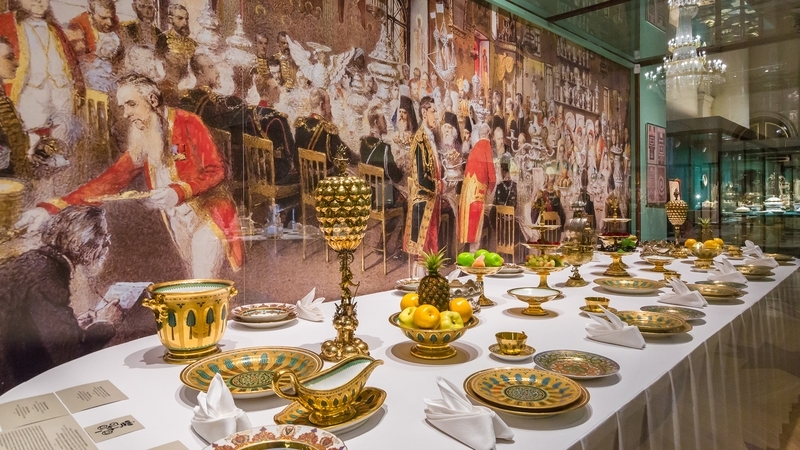 After the war with Napoleon he travelled a lot across the Europe and tried not to take foods with him but was often tasting local foods. 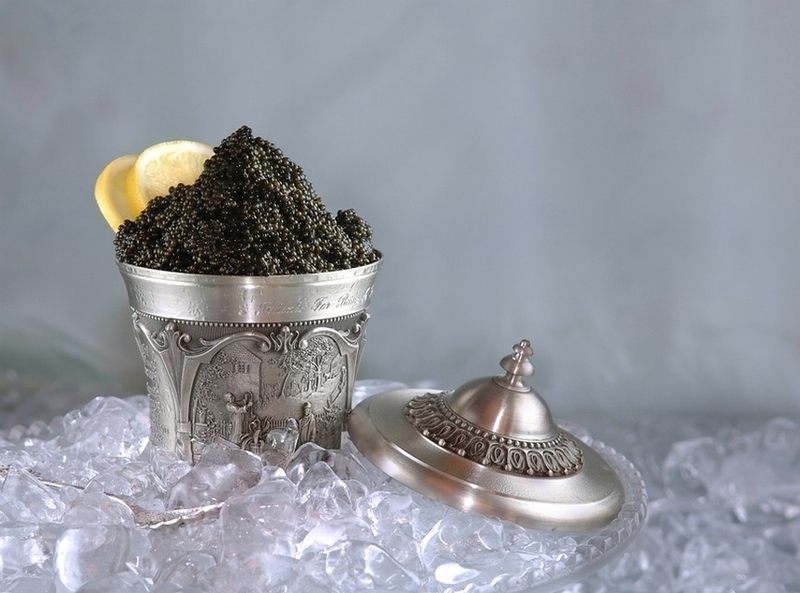 It’s been said that he also popularized caviar in Europe. Foreigners looked at it like an “exotic Russian food”. They even tried to boil and cook it at first as they didn’t know they had to eat it as is. 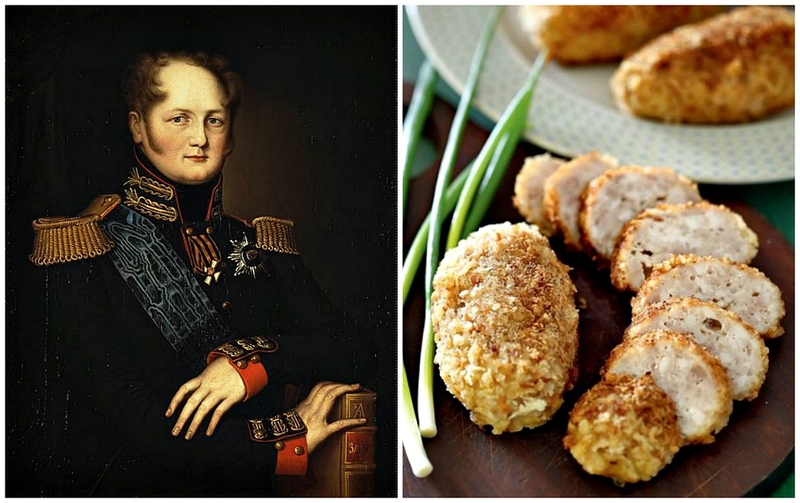 Now let’s see what Russian Tsar Nicholas I has eaten. Here you can see him on the pic above. Instead of strawberries in the morning he was fond of pickles first thing in his day. However despite this strange choice many considered him a health lifestyle fan. His contemproraries were saying he didn’t care about food much. His travel companion was writing that: “he eats only cabbage soup with meats, some game meat and fish, also pickles. Drinks only water.”. 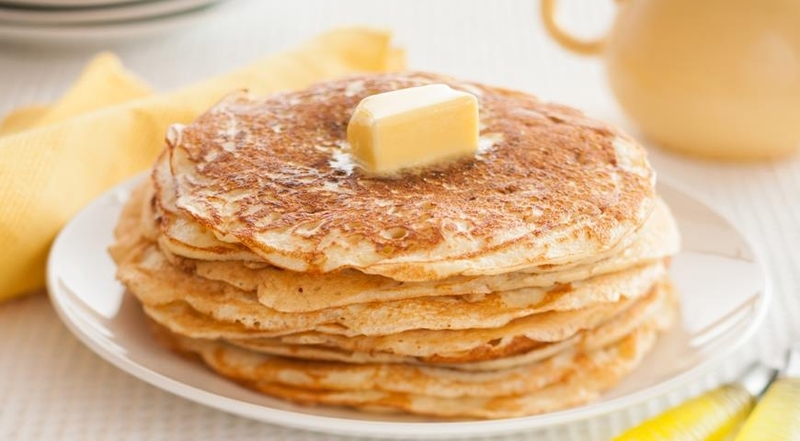 He also liked famous Russian buckwheat porridge also known as “Kasha”. It has been said that during last years of his life he preferred vegetable dishes and fruit drinks. 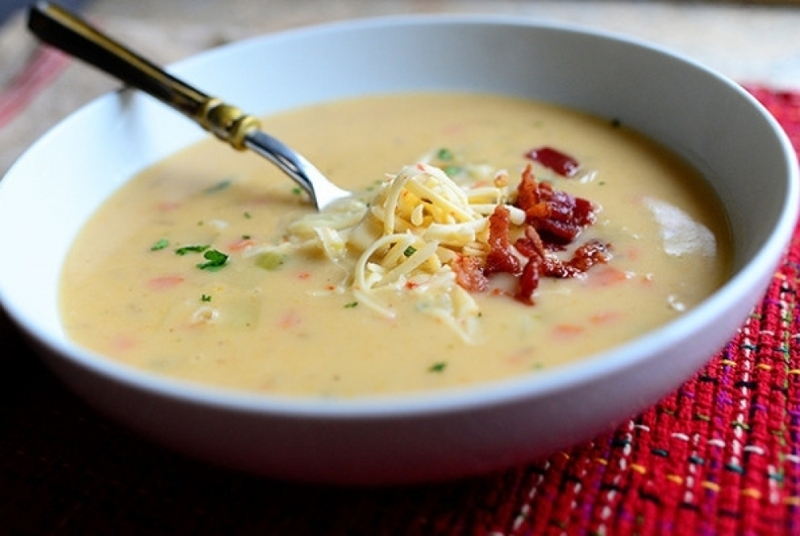 Like this potato soup on the pic above. He also probably tried fasting for health. – at breakfast he was having tea, sour-sweet bread, two small buns, and dried breads. – at lunch he had sugar pieces (around 2 pounds) black and green teas, coffee, whipped cream, different buns and cakes. Pretty weird choice isn’t it. Also he liked bliny (“crepes”). – at dinner he often “ate just some rye breads”, remembers his his autobiographer. “Or was getting some pickles water and drank it”. Also he demanded not to be served more than three types of food at once. 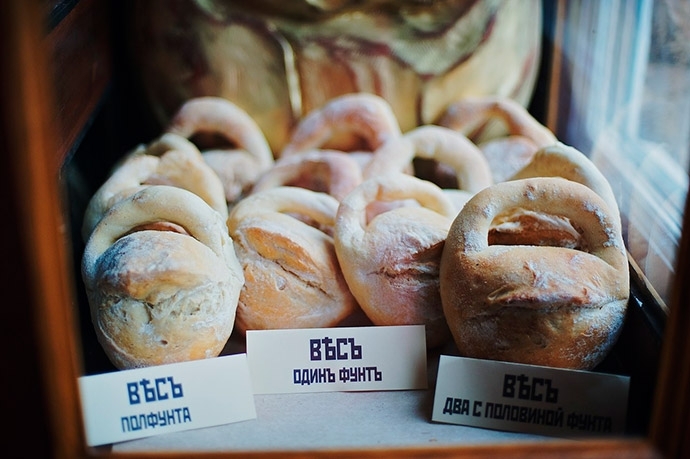 This are typical old Russian breads he liked so much. Also Nicholas I liked ice-cream a lot, but when doctors banned his brother Great Duke Michael from eating ice-cream the Tsar stopped eating ice-cream as well to support his brother. 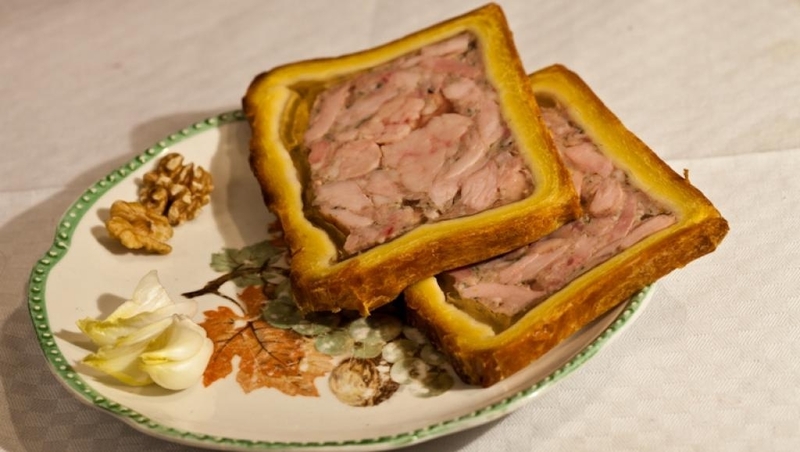 Also a “Strassburg pie” – here it is on the pic above. And now Alexander II. 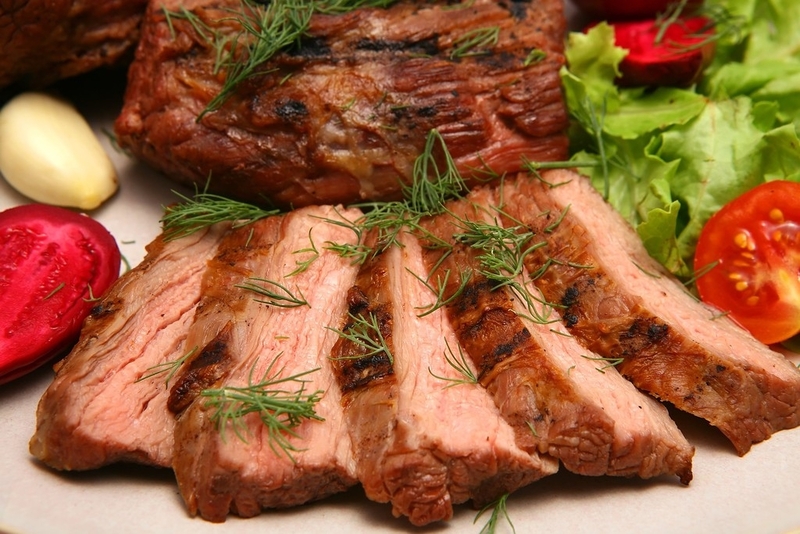 He was sort of fond of char roasted meats a lot. Also as a passionate hunter, he was fond of game meats, and especially eating and cooking outside in the fields after the hunt. 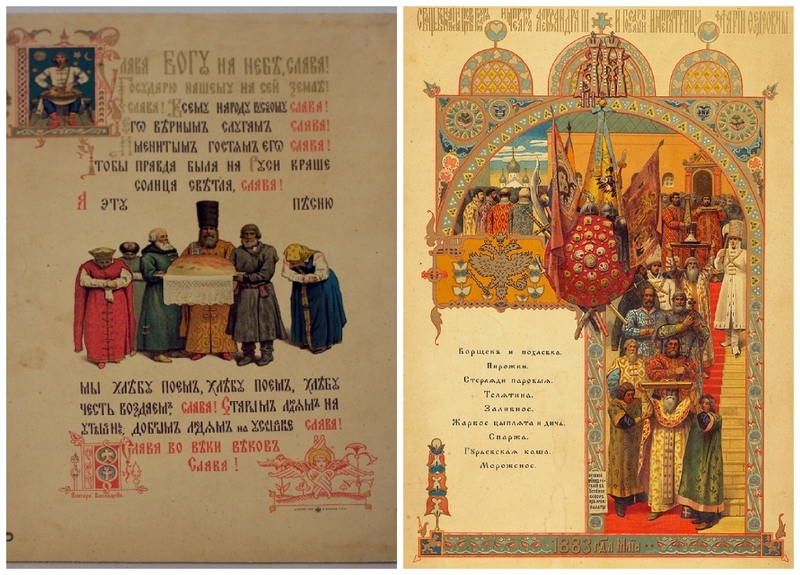 Here are some pictures that were drawn at his time (in the 1860s) depicting a typical Tsar’s outside dinner. Funny enough the moose were attracted by the smell of foods and the waiters had to turn them away fighting with frying pans (on the right pic). 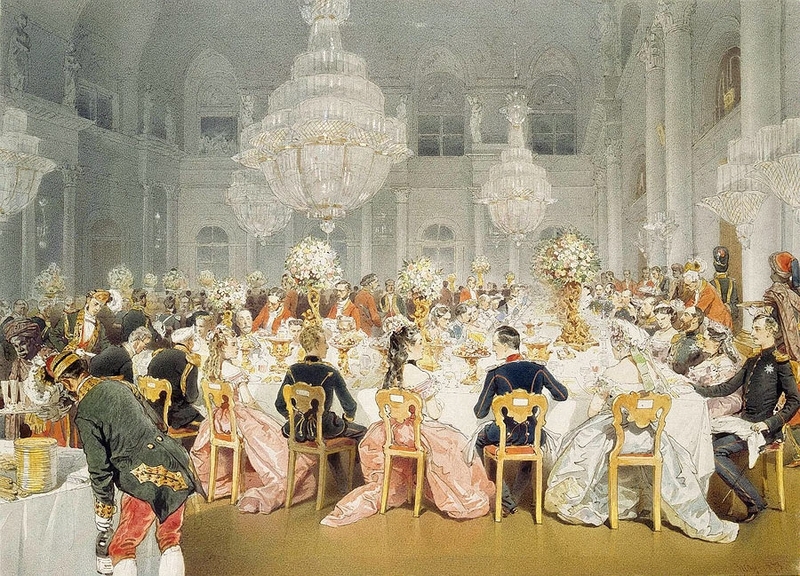 Despite that they were eating outside, they were bringing luxury dining items with them – like clean tablecloths, expensive china, crystal drinking pots. 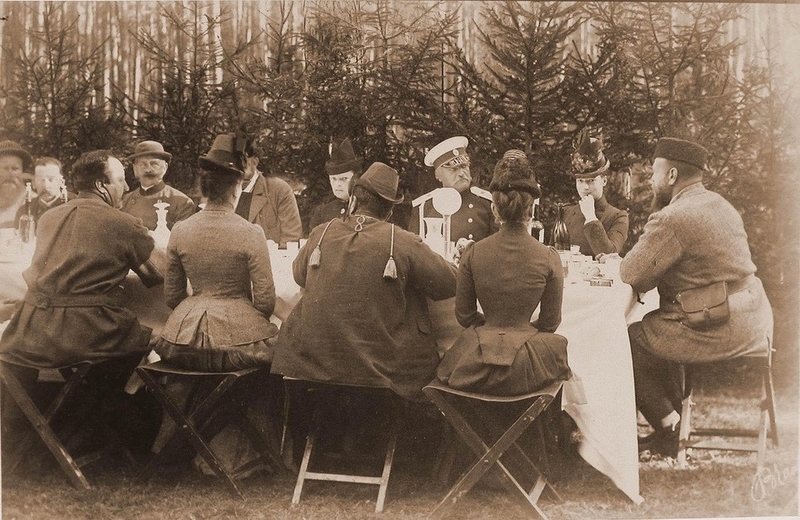 Also the Tsar hated using chairs during his “camping dinners” so everyone was standing or sitting on the broken trees holding their plates on their laps. 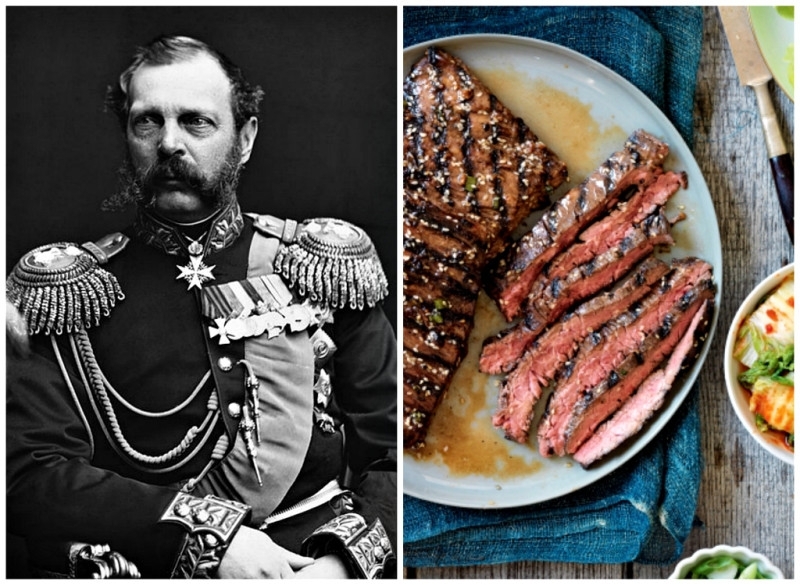 The Tsar was fond of trying out the charred flesh or liver of a freshly killed bear. Then after this outside dinners they returned to the palace and continued partying there, bringing the freshly killed game meats inside and asking the court’s 20 piece orchestra to play music for them. Now this sounds more like what a Tsar should be doing. 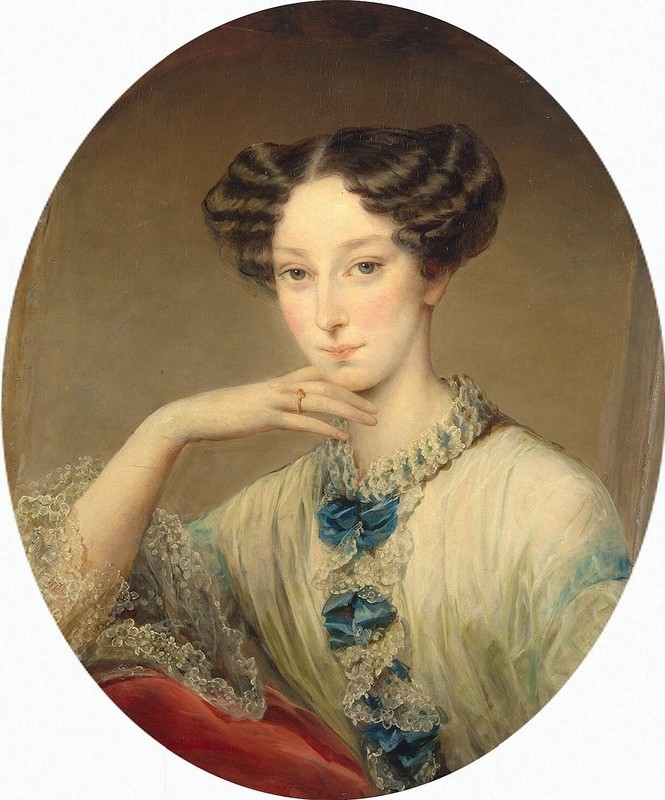 Maria was a wife of Alexander II, and here is her portrait. Tsar Alexander II was very fond of his wife and was indulging all her requests. Like when she asked to have a barrel with an apple tree growing in it brought to her so she could pick the apple she liked most right from the tree. In spring time he was ordering that big baskets of fruits and berries be brought to her room. But soon he stopped caring as he found a new lover for himself. Now let’s talk a little about Tsar Alexander III. He was a pretty recent Tsar so we have his photo here too, not just a portrait. It has been said he was fighting obesity in his life. However he liked to eat a lot as well. He was thinking that a fat and formless (body-positive) Tsar was not looking cool and was sending a bad image to his people. However, as like everyone on a diet, he had periods of away from the diet and started eating everything without any limits. Especially at night. For this there was a special room next to his bedroom where he had pots and other kitchen things so he was able to quickly prepare food right in his room. Also sometimes he asked to bring him “the most simple foods from the soldier barracks”. 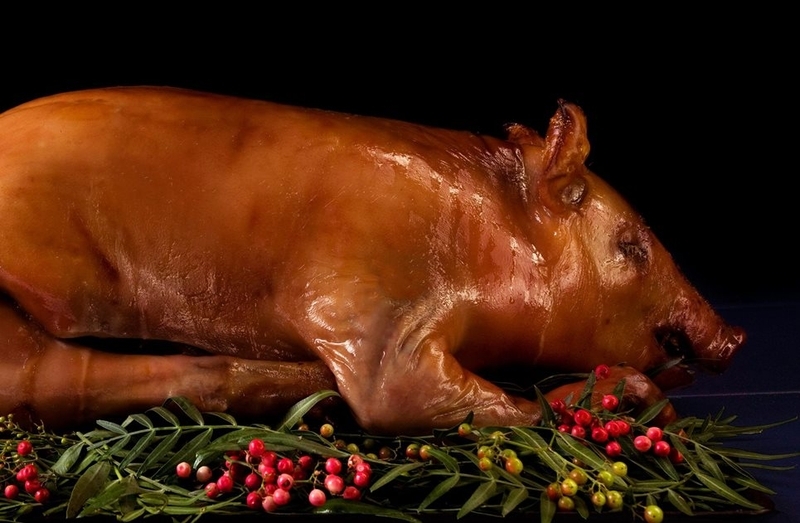 It has been said his favorite food was a whole roasted little pig with horseradish. He also liked pickles, but this is a normal thing for every Russian isn’t it? He was also ordering his people to bring him rare sauces directly from Paris and he tried them all. He especially liked a Cumberland sauce (in the pic above). It has been said that a British king was trying a dish with this sauce at the Russian Tsar’s dinner and said “this sauce is so good you can eat your own mother with it”. How rude! Also he liked a rich desert menu. Being fond of fishing he also liked to eat freshly caught fish. 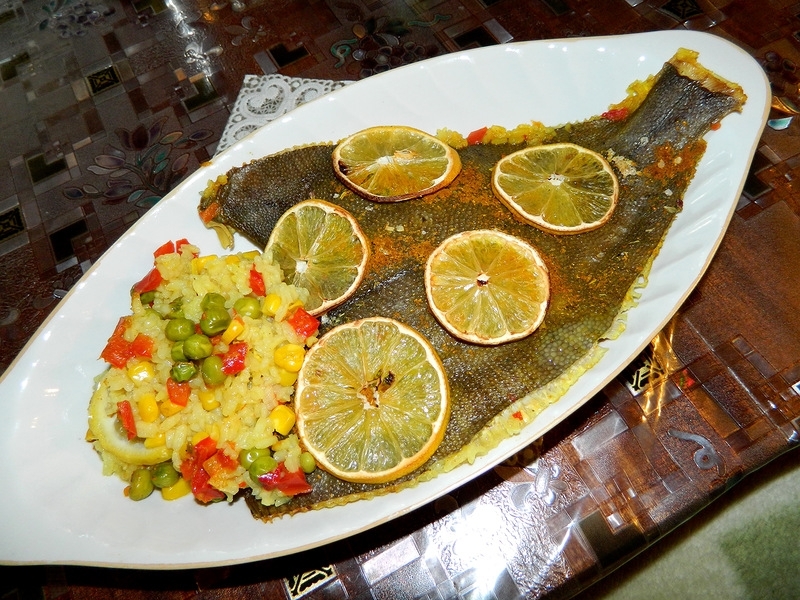 When they were spending time in their vacation residence in Finland (Finland was part of Russia at that time) he was catching fish and his wife was cooking this fish for him herself. 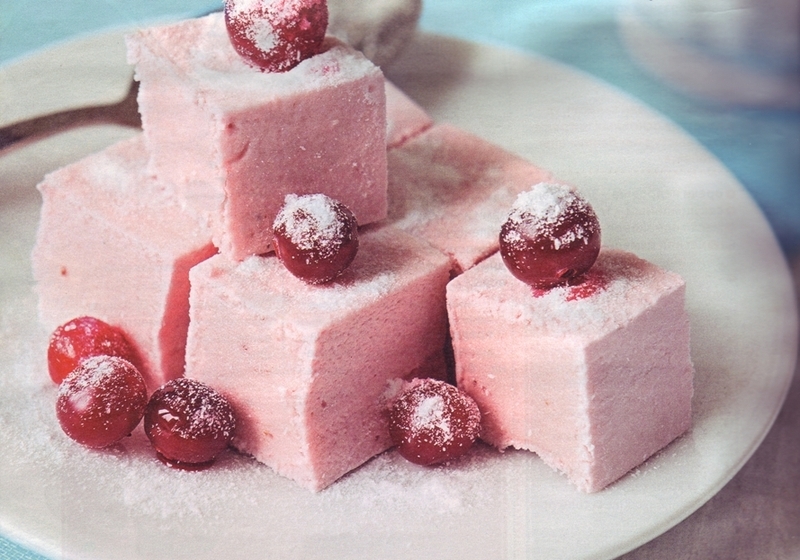 Also he liked the fruit mousse and liked to finish his dinner with a cup of hot chocolate. However he often was not happy with the quality of cocoa he was served. 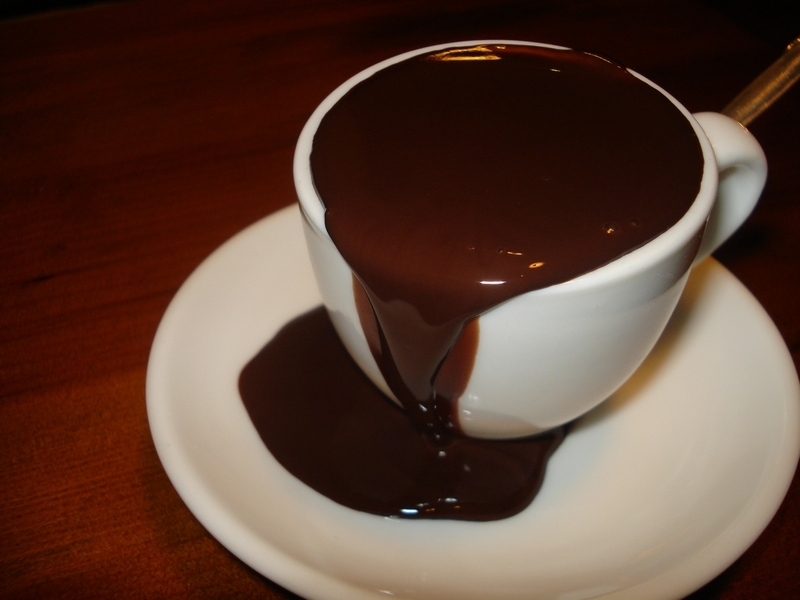 He often refused to drink the hot chocolate brought to him as it was not up to his standards. So it was a big head ache to his cooks to get their hands on good cocoa. Refusing to drink cocoa for some unknown reason wasn’t just his only weird behavior. Sometimes he could stop eating and throw away a fork just because “this fork is ugly”. And once he was said to throw a fork into an Austrian ambassador after getting mad at him during the dinner. Also Alexander III was sometimes checking the expense books of the kitchen by himself. And here above you can see a page of his menu still intact to our day. 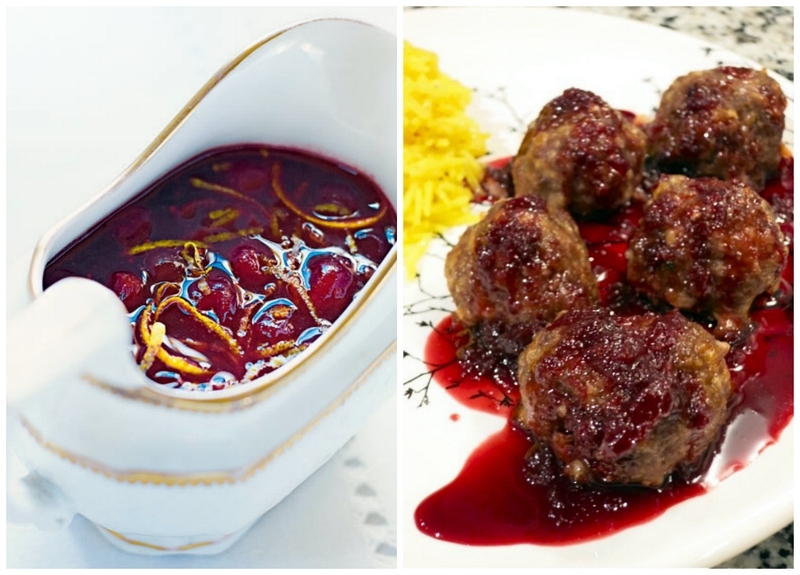 It mentions some of the dishes like Borsch, Pirogi, Fried Chicken and Game Meat, asparagus and ice-cream. 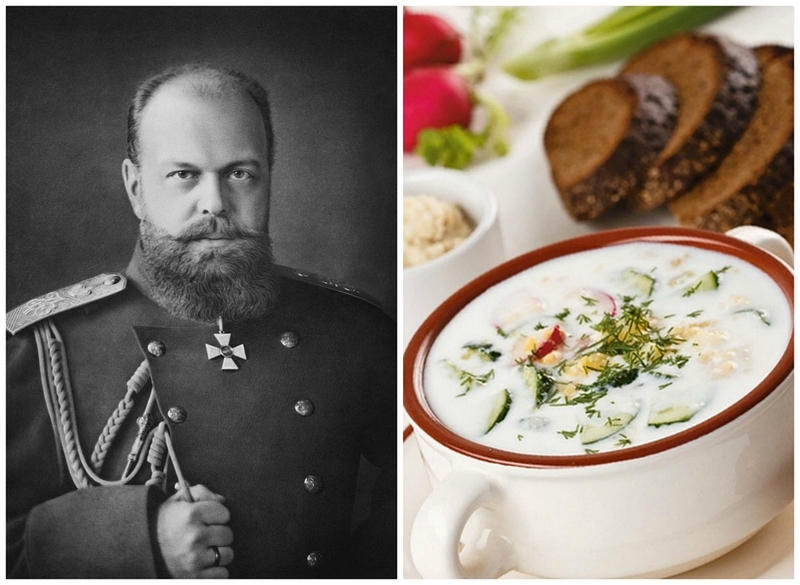 When he was travelling in the South of the Russian Empire he was eating a lot of onions and garlic which was considered a bad habit for a Tsar but was very widely used in cuisine of that region. The Queen was sort of lecturing him for this because she thought it sent a bad message to his subjects. Also she herself couldn’t stand the smell of garlic. Here you can see them at dinner on this old painting. Here is one of the soups the emperor liked too. 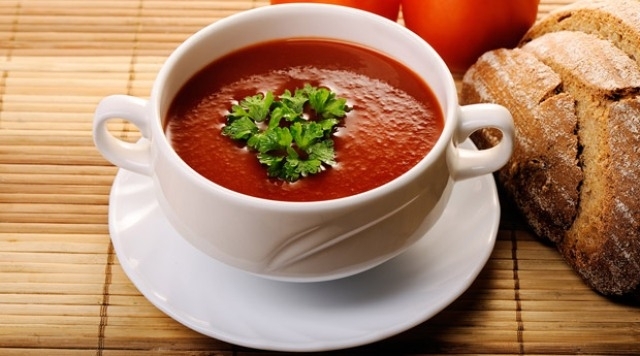 It was a Bordolese Soup – it consists of white or red wine, sauce and tomatoes. Is it a food or a drink after all? 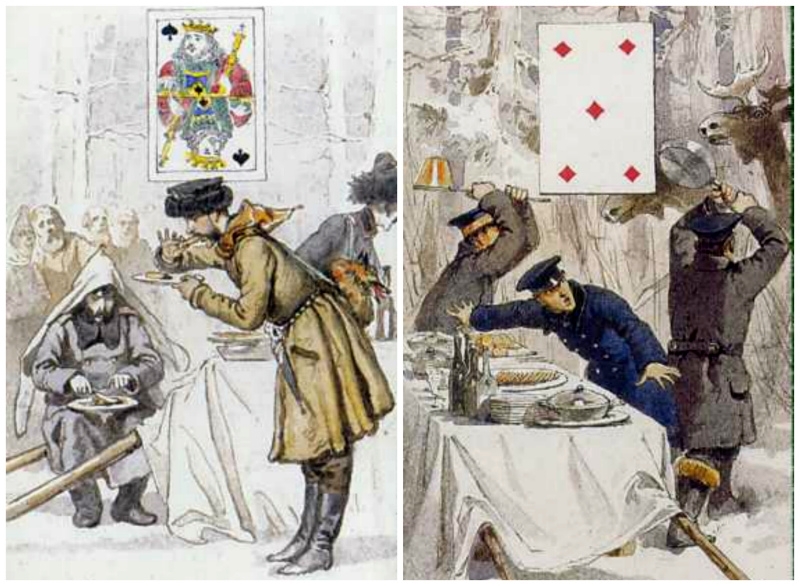 As Alexander II, the new Tsar Alexander III also liked to hunt and have dinners outside. 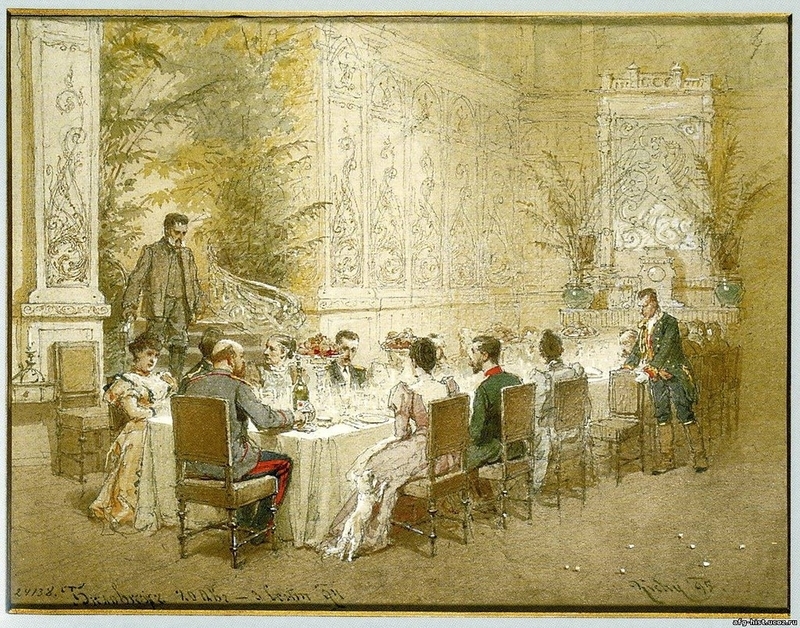 Here you can see a surviving photo of this Tsar (on the right sitting at the right head of the table), on his right hand is his wife Queen Maria. 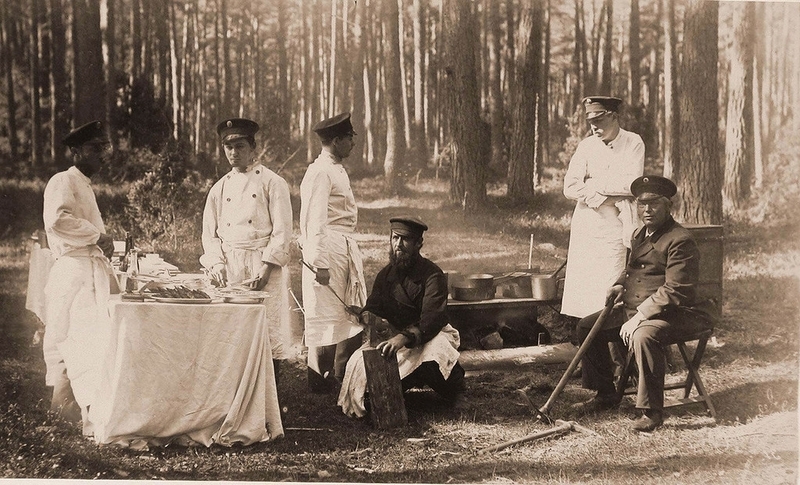 And here are the Tsar cooks cooking his dinner outside in the forest. 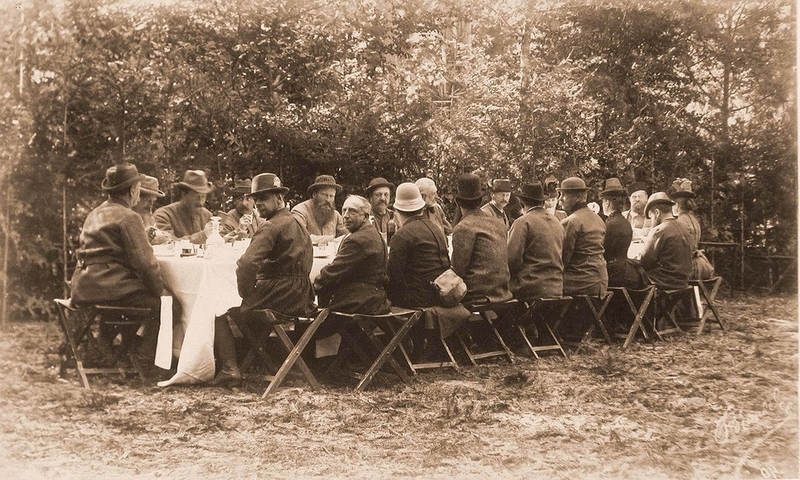 And here you can see Tsar Alexander III again (on the right) and his wife Queen Maria (sitting on his right hand) during their forest dinner. One day last year on Skype, I saw my friend in St. Petersburg eat an entire jar of pickled tomatoes. Following that, he drank the entire pint jar of leftover pickling brine.